NOKIA 7.1 goes official with 5.84 FHD+ HDR PureDisplay and Snapdragon 636. HMD Global today announced Nokia 7.1 - the first smartphone to come with PureDisplay screen technology, which will take your viewing experience to the next level due to its high contrast ratio, greater clarity and enhanced colours. The Nokia 7.1's HDR display offers an advanced imaging experience powered by a dual rear depth sensing camera with two phase detection and ZEISS Optics. The Nokia 7.1 is the first smartphone to come with PureDisplay screen technology for stunning HDR cinematic quality entertainment inside and out. Supporting HDR10, the Nokia 7.1 PureDisplay delivers higher contrast (1,000,000:1 dynamic contrast ratio) and greater clarity; revealing the detail in both light and dark areas as well as stunning vibrant colours. The Nokia 7.1 features a bright 5.84" Full HD+ display with 19:9 screen ratio. Non-HDR content on the Nokia 7.1 is up-scaled in real-time using a dedicated 16bit engine, processing millions of pixels per second to provide the best possible display quality. The Nokia 7.1 is powered by the Qualcomm Snapdragon 636 Mobile Platform, which supports a major leap in enhanced performance making it great for streaming HDR content with ease. The USB type-C fast charging port delivers up to 50% of your battery back in 30 mins. The Nokia 7.1 highly sensitive ZEISS Optics 12MP/5MP dual cameras with two phase detection enables fast accurate autofocus giving great shots in in both bright and low light conditions. Achieve the perfect picture with HDR photography giving you crisper and sharper images. Capture professional studio style shots with the rear depth camera supported 'bokeh' mode as well as effortless front portrait shots. You can also reduce the effects of unstable hands while filming with Electronic Image Stabilisation (EIS) technology and relive your memories as if you were still there with high fidelity 360° Nokia spatial audio. The Nokia 7.1 joins the comprehensive line-up of Nokia smartphones in the Android One family, delivering a high-quality software experience endorsed by Google. Nokia smartphones with Android One offer great storage and battery life right out of the box. The Nokia 7.1 will receive three years of monthly security patches and two years of OS updates, as guaranteed in the Android One programme. The Nokia 7.1 is built ready for the Android 9 (Pie) software update, which includes AI powered features that make your device smarter, faster and adapts as you use it. 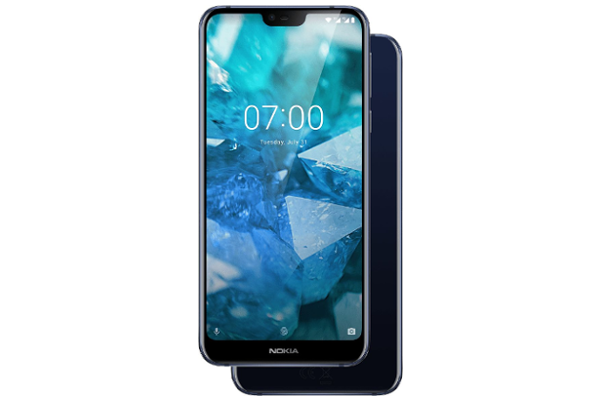 The Nokia 7.1 comes in Gloss Midnight Blue and Gloss Steel and is available in selected markets available from October in two variants - 3GB/32GB and 4GB/64GB. The global average retail price will be 319€ / ~$367 for the 3GB/32GB and 349€ / ~$401 for the 4GB/64GB.